Greek cuisine is considered one of the best in the world due to its wide variety of flavors and cultural influences. Many Greek dishes utilize olive oil, fish, wine, olives, cheese, herbs, and yogurt. 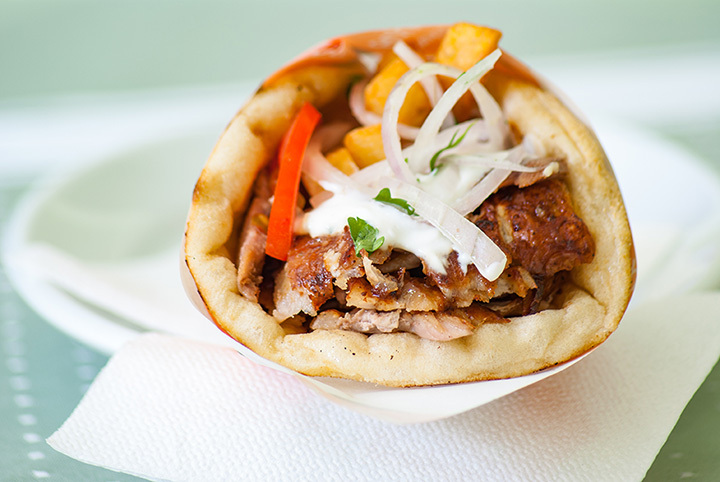 Delicious dishes like gyros, falafel, kabobs, baklava, and tzatziki can all be enjoyed thanks to Greek cuisine. Taste some of this delightful Mediterranean fare at one of the best Greek restaurants in North Dakota! Fargo’s Mediterranean Grill prides themselves on their healthy Mediterranean cuisine, which they claim helps keep diners in good health. The authentic menu features natural, fresh, and never frozen dishes like kabobs, Mediterranean burgers, pan seared fish, falafel, traditional Moroccan tomato soup called harira, hummus, and Greek salad. Whether you’re a Greek cuisine aficionado or you’ve never even tasted a gyro, there is something for everyone at Mediterranean Grill! Cafe Aladdin specializes in not only Greek fare but also middle eastern, so there are all kinds of culinary delights at this unique and multifaceted restaurant! The menu features favorites like stuffed grape leaves, gyros, kebabs, fresh hummus, baba ganoush, pita tacos, spanakopita, Greek salad, and curried rice. There are also several vegetarian offerings. For newcomers, the friendly and warm employees can explain all the different dishes on the menu as well as give insights into Greek culture.